The chorten was consecrated in the memory of the Third King of Bhutan, Jigme Dorji Wangchuck on July 28, 1974, following his unexpected death while travelling outside the country. The whitewashed chorten has four stone snowlines guarding the four corners. 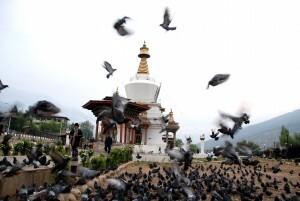 It is a very popular religious monument in the city and the sight of elderly people circumambulating around the chorten is a common during the day and night. The paintings and statues inside the monument provide a deep insight into Buddhist philosophy.